Right, I’m having a pit stop this weekend so no guests. However, I thought it might be an opportunity to post something. Now I’m not exactly the most regular of posters basically because this fifth novel of mine has taken up so much time. I hate to say it but at times I’ve become totally obsessed with writing it and now that’s over, undertaking the editing. This as all writers know, is not a healthy place to be in. My work I know is so much better when I step back for a while and give myself a break. So this weekend having no Tea and Talk guests, I thought I would shut the manuscript away in its electronic file on the computer and put some thoughts down about creating backgrounds for my novels. So how do you create your backdrops, the places where your action takes place? Do you invent them? Or do you borrow places? Well I do a bit of both. When writing my first three books which formed a trilogy I obviously did a lot of visualising but in order to have some ‘glue’ to bind the whole thing together and give it shape, I also borrowed locations. Firstly, for the village where some of the earlier action takes place, I used Bathford, where I live. It’s quite a large village which sits either side of a river valley with road and rail running through as well. The south east side has a wood above and that part of it seemed absolutely right to be cast as the West Somerset village in my story. So it was absolutely perfect when writing to gaze across and imagine I was in Meridan Cross – it made telling the story so much easier. Then there was the small fictitious provincial town of Kingsford where the three central girls Ella, Jenny and Issy attended Kingsford High. 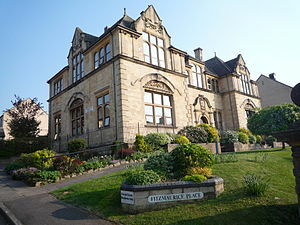 Described in the book as an old seventeenth century manor house, I took my own school, Fitzmaurice Grammar School, Bradford-on-Avon, which was closed in 1980 following establishment of one large comprehensive in the town. It remained derelict for some time afterwards before being converted into expensive retirement flats and renamed Fitzmaurice Place. Fitzmaurice actually started its life in Victorian times when Lord Fitzmaurice of Leigh turned the manor house into a school. You can pick up the history on Wikipedia. Issy’s parents owned The Bridge Hotel in the town and for this I used The Georgian Wine Lodge which is situated down by the river in the centre of Bradford on Avon. When I was at school it was The Westbury Hotel and in between sitting our ‘O’ levels we used to come down here and spend time in the coffee bar which was situated through the archway behind the hotel. We whiled away the time drinking Coca Cola, discussing fashion and playing the latest hits on the coffee bar’s juke box. Oh and I met my first serious boyfriend there! Next the girls moved onto College in Abbotsbridge, another slightly larger local provincial town. For this I again revisited my own history. I spent two years at Trowbridge College of Further Education where I took an ONC in Business Studies coupled with Shorthand, Typing and Audio. It was promoted as a senior secretarial course and was quite intensive with subjects like Economics and Law as well as building speeds in shorthand and typing. So where better to place the three friends than following in my footsteps? As you can see from the photo it was sadly a typically unimaginative 1960s building! Next The Mill Club. This was fundamental to the whole trilogy; a place where central characters Matt and Ella met and fell in love and Matt’s band The Attitude were discovered. Matt’s father, ex-fifties singer Tad Benedict owned and ran it. It was situated by the river and hosted live bands as well as having a resident DJ. Inspiration for this came from The Keel Club a very well known club on the outskirts of Bath which was run in the sixties by entrepreneur Keith Johnson; quite a visionary. Formerly known as The Weir Tea Gardens, he bought it and renovated the building, creating The Keel Club – one of the most sought after local ‘in’ places to go in the late sixties, with the same live band and DJ format as I borrowed for The Mill. So there we have it, five places which I deliberately chose to put into The Behind Blue Eyes trilogy. Of course having these in mind did make it much easier when setting or describing a scene and gave it more credibility. As I said above, fact is the glue essential to bind the story together and give it a defined shape, making it more realistic. It’s a platform for the imagination the writer uses to create the characters and situations that drive the plot. But I can only speak for myself, other writers may see things in a completely different way of course! Well, how do you go about this very important part of writing? Great pics Jane, realism is always preferable in locations and by the look of your pics you have it down well. Laurie, kind of you to mention my photos too. Appreciated. Loving Jo’s as well and yours. We are having a ‘love in,’ here today. Cool….who has the wine?